NOWCastSA announces it has raised rates for its live webcasting services, has updated its Nonprofit Membership Program benefits and launched its Business and Professionals Membership Program. As of March 9, 2016 the starting rate for a live webcast or video production will be $3,200 for events up to five hours including setup and takedown. Events five to nine hours start at $4,400. Development Director Amanda Evrard says NOWCastSA aims to find balance between covering its expenses and providing low-cost, high-quality webcast and video production services. “We have raised rates overall, and also implemented a discount for organizations that pay for services in advance,” says Evrard. “We’ve updated our Nonprofit Membership Program, and also launched a new membership program for businesses and professionals. Members can receive discounts on webcasts in addition to several other benefits. We believe this will ensure our services are still affordable for the smaller nonprofit organizations who we partner with." NOWCastSA offers sliding scale rates for annual memberships for nonprofits and businesses. NOWCastSA Legacy Nonprofit Members include Friends of Communities in Schools San Antonio, Master Leadership Program of San Antonio and Bexar County, San Antonio Public Library Foundation, UTSA College of Public Policy, and the Daedalian Foundation. NOWCastSA's live webcast and video production services accounted for 65 percent of its revenue in 2015, up from 48 percent in 2014. "This year is about capacity building and diversifying funding sources," says Evrard. "In the six years since NOWCastSA launched, we have proven the value of our services and cultivated a great following throughout San Antonio and beyond. "Raising the prices of our webcasts and production services is just one piece of the puzzle. We need more donations from individuals, more memberships, and more sponsorship and underwriting support at every level. That will allow us to continue to provide a free website and publishing platform, to offer free community journalism and digital technology training to the public and to democratize data through our community information maps of services. We need more financial support overall to provide access to information for everyone," says Evrard, "not only to organizations that can afford to pay." To see NOWCastSA’s webcast rate sheet, click here. To learn more about NOWCastSA’s Nonprofit Membership Program, click here. To learn more about NOWCastSA’s Business and Professional Membership Program, click here. To learn more about NOWCastSA's Individual Membership Plan, click here. To see NOWCastSA’s sponsorship rate sheet, click here. 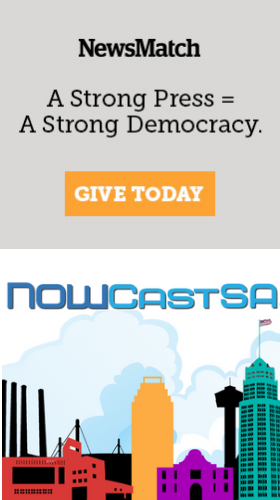 To donate to NOWCastSA, click here. Editor's Note: NOWCastSA charges the same rate for live webcasts and video productions because costs are calculated based on total production time. While live webcasts involve more pre-production time and rely on a solid Internet connection, videos that are not live require more post-production time so the total staff time is the same for both project type.